Summer time for varsity baseball players means lots of summer tournaments–which means happy parents. 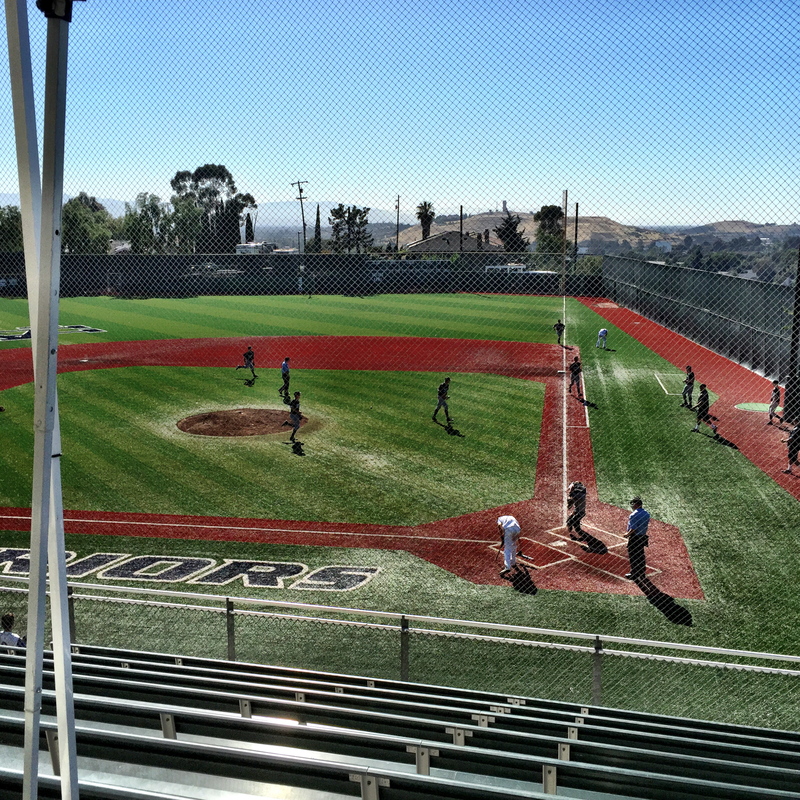 This weekend, we (Peter) participated in our second Mitty tournament… Mitty being a large, somewhat prestigious annual summer invitational hosted by Archbishop Mitty High School in San Jose. It draws twenty three of the best teams in the state, many private schools from the peninsula. It includes some of the better schools from our neck of the woods, and even a handful of very elite-ish schools from southern California. I say elite-ish like I don’t really want to admit it, but most of these schools are expensive, private catholic schools that place a huge emphasis on their sports programs. It’s a lot about money and privilege. They recruit in order to be competitive.. and they fleld amazing teams. We benefit from some exceptional competition. Friday’s games were held at Christian Valley High School. Lordy. From high atop a hill, the Silicon Valley looked absolutely gorgeous–mountains all around, downtown San Jose visible in the distance looking like the Emerald City. It was very hot, but we had a steady breeze and were under shade structures, so not bad at all. For us. The boys on the artificial turf… another level of sizzling. My Aunt Joy came over from Pleasanton for the game, which was so sweet and wonderful. Rare has any family member on either side ever seen Peter play, so it was very nice to have her there. What’s more, having been a PE teacher and coach in this area her entire career, she knew a thing or two about the schools we were facing–and was impressed. Peter was the starting pitcher in the first game against De La Salle (a private catholic high school in Concord) and went four innings. After spending his first day of summer swimming and carousing all day with friends and staying out way too late, he woke up with a cold and sounded pretty miserable. I worried about him, forgetting he’s 16 and nothing seems to slow him down. I, of course, think Peter and Ray pitched like champs, especially in that heat, especially against that team. In the second game, we lost a close one to Harvard Westlake (4-3)–a powerhouse private school from LA. We out-hit them in that game and had a perfect chance at the end to go ahead, but… baseball. I think this year’s team is going to be a much bigger hitting team than last year’s. The best thing about away tournaments is the hotel time and team bonding. Dan brought 18 down for this tournament (only 15 stayed overnight) and they hung out a lot at the pool, traveled in a huge pack to a nearby restaurant for dinner (some of us parents peeled off and went elsewhere) and just got a chance to get to know one another better. It’s a new blend of players and I think that this year’s seniors (our boys) are a lot more amenable to fraternizing with the incoming players (which ought to make for a stronger team culture). So, day one, Mitty. FUN. … and…. thatsalotta baseball talk. On a slightly different topic…. how precious have hotels gotten? 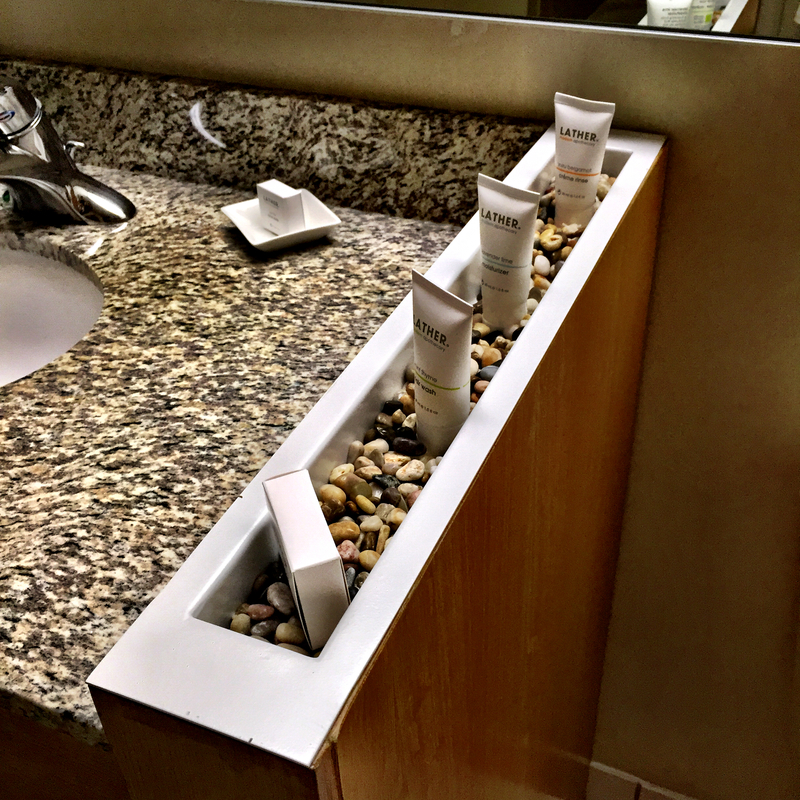 This one nestles your shampoo, conditioner, moisturizer and soap in a bed of rocks.